Square Enix confirmed some additional details from Wednesday's Final Fantasy press conference, specifically regarding the cancellation of Final Fantasy XV's PC version. Features like modding and ray-tracing likely won't come to the game once the final DLC is released. FFXV on PC already supports modding, but Square Enix announced previously that a more robust system that includes things like a level editor would eventually come to the PC version. Those plans, along with the multiplayer expansion, Comrades, and three of the four planned DLC for FFXV are all cancelled. What's more, FFXV was suggested to include new graphical features thanks to Nvidia's new line of graphics cards. Features like ray-tracing won't be coming to FFXV either. On Wednesday Square Enix held a livestream and announced several big news for FFXV. Not only was the planned DLC cancelled but FFXV director Hajime Tabata announced he was leaving Luminous Productions and Square Enix to start his own indie game studio. Fans upset by the news have actually made a mod for FFXV PC to memorialize the occasion. 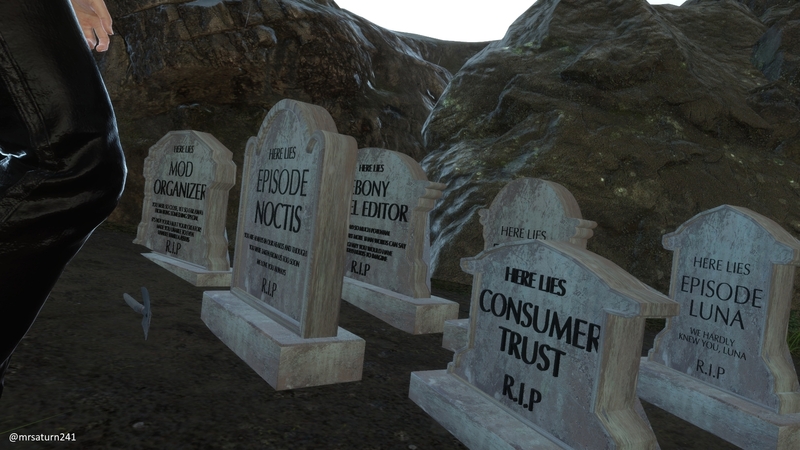 Modder mrsaturn241 released an FFXV Memorial mod which adds several tombstones commemorating, among other things, Episode Noctis, Episode Lunafreya, Mod Organizer, and Consumer Trust. This was some sad news as Tabata was instrumental in getting the long-stalled FFXV released. We reviewed FFXV when it came out and enjoyed the new take on the Final Fantasy formula, despite some mixed reactions to the game. Tagged with News,	PC,	Square Enix.